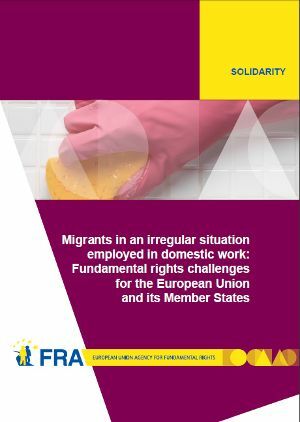 Based on research conducted with (predominantly female) migrants and civil society organisations in 10 EU Member States - Belgium, France, Germany, Greece, Hungary, Ireland, Italy, Poland, Spain and Sweden - this report highlights some of the fundamental rights challenges affecting migrants in an irregular situation employed in the domestic work sector. It focuses on the experiences of migrants in an irregular situation. While many fundamental rights issues raised in this report are common to other persons employed in the domestic work sector, the risk of violations is exacerbated for workers who do not have the right to stay in the host country. This report deals with domestic work performed by third-country nationals who are staying in the EU in an irregular manner as they do not or no longer fulfil conditions of entry, stay or residence. The report does not, therefore, cover undeclared work performed by legally staying migrant workers, such as, for example, nationals of new EU Member States whose right to work in other EU countries remains restricted due to transitional measures, or with respect to third-country nationals who work in violation of their visa regime. For more details, read the press release or download the full report below.